Indicated for the symptomatic treatment of respiratory diseases associated with an impairment or elimination of the mucusafscheiding: - Acute bronchitis, tracheobronchitis, chronic bronchitis - chronic obstructive bronchopulmonary disease, bronchiectasis - acute sinusitis, chronic sinusitis. 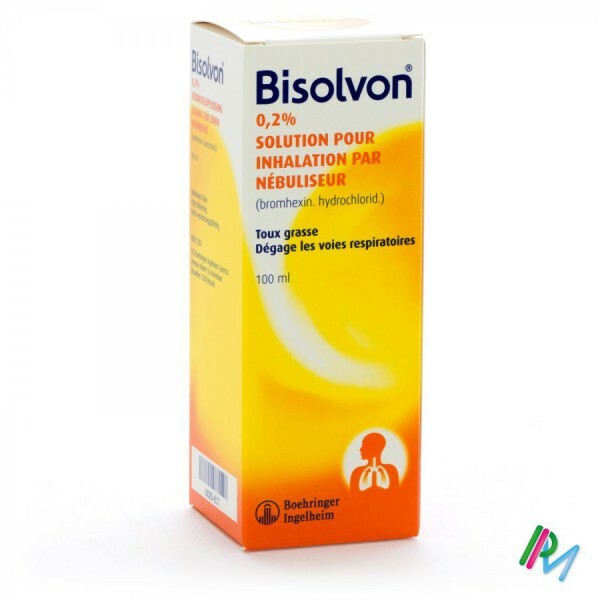 Bisolvon Nebuliser 0.2%: 1 ml contains 2 mg Nebuliser broomhexinehydrochloride. Inhalation: solution to 2 mg / 1 ml (1 ml = 14 drops to 15 ). Adults: 2 ml solution 2 or 3 times a day. Children older than 10 years: 2 ml solution 1 à 2 x per day. Children 5 to 10 years: 2 x 1 ml solution per day. Children from 1 to 5 years : 2 x 10 drops per day. Infants: 5 drops 2 times a day. 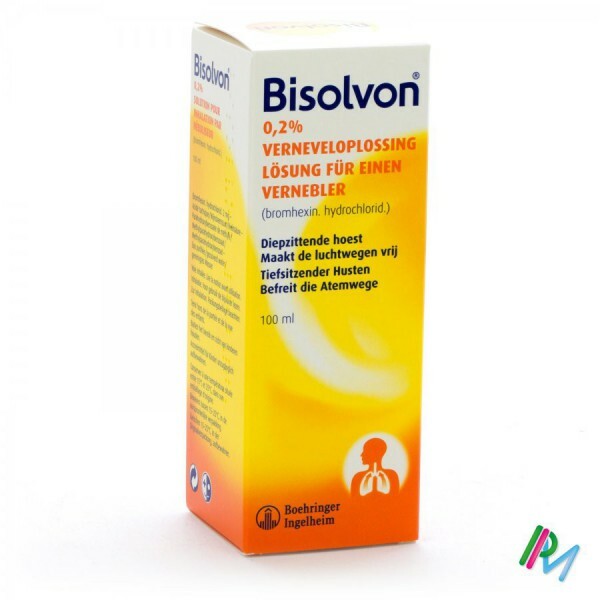 Usually Bisolvon solution diluted with saline. In adults the maximum dose of 8 mg per aërosolbehandeling, the maximum daily dose is 24 mg. This is a medicine, no prolonged use without medical advice, keep out of reach children, read the leaflet carefully. Ask your doctor or pharmacist. In case of side effects, contact your doctor. Hypersensitivity to bromhexine or any of the other ingredients of the medicine. Bisolvon solution (which has an acidic pH) may not be mixed with an alkaline solution. In hypersensitive individuals, it is advisable to intended for inhalation solution first body to bring to cough response to inhalation of a cold solution to avoid. In asthma may be desirable to pre-dose in a bronchodilator aerosol form to submit (a beta-2 - agonists or anticholinergic) to a better distribution of the bronchi in Bisolvon available. The acidity of the solution is necessary to caution ulcuspatiënten. If the patient can not cough up sputum, the airway, if necessary, are kept by postural drainage or aspiration. addition of a liquid making a plea hoeststillend means illogical. bromhexine was already a large number of pregnant women and women of childbearing age used. It was never any toxic effects on the mother or the fetus determined. Nevertheless, one also with this product, as with all medicines, the usual precautions, especially during the first 3 months pregnancy. bromhexine can penetrate into the breast milk and is not recommended during lactation. 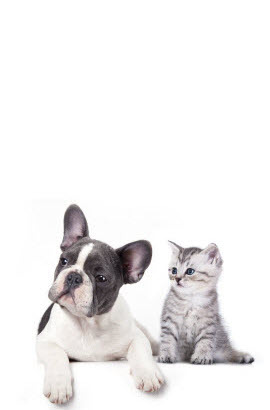 Sometimes mild gastrointestinal disturbances occur including nausea, dyspepsia, vomiting, diarrhea, dizziness and headache. Very rarely allergic reactions were observed, mainly skin rash, bronchospasm, angioneurotic edema and anaphylactic reactions. 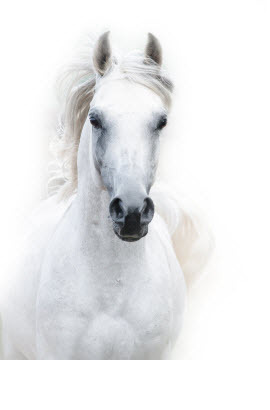 Exceptional increases were reported transaminases. 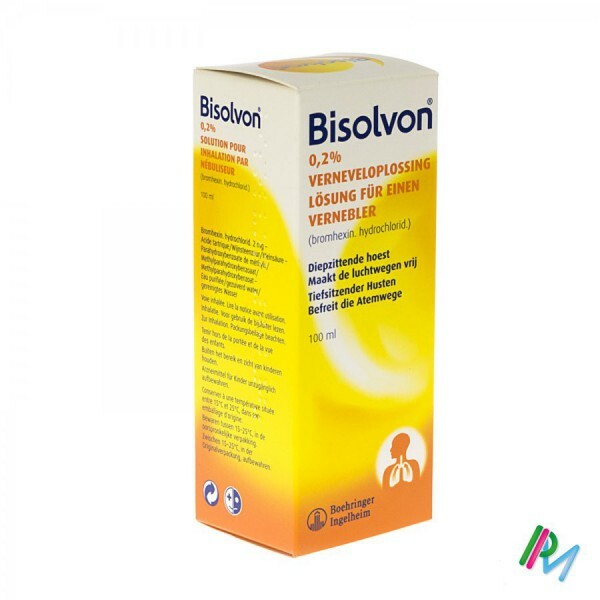 Bisolvon The therapeutic margin is very large, single doses of the order of 50 times the therapeutic dose would be likely to cause hypotension. In overdose symptomatic treatment should be administered. Tartaric acid - Methyl - Purified water. Concomitant administration of bromhexine and antibiotics (amoxicillin, cefuroxime, erythromycin, doxycycline) may lead to increased antibiotic concentration in the lungs . No other clinically significant interaction was reported.